Please be kind as its my first post. Previously posted as 2 for £8 at Farmfoods or £4 at Morrisons, my local Farmfoods (Cardiff) have just started this offer and had plenty in stock when I visited today. 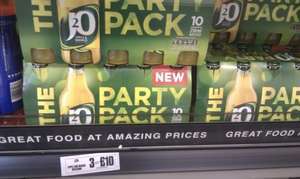 3 for £10 is clearly a bargain here bringing it down to £3.33 a pack or 33p a bottle, which is a brilliant price. Note: These bottles are not the regular size 330 ml J2Os but rather a slightly smaller 250ml bottle but still great value. Don't forget the added sugar! yes or 29p for one - I like the mango one but wouldn't want to buy four! "It's my first post" Jesus Christ that's annoying. I don't really have a Home Bargains near me but thanks for the info. Deal posting newbie! This is Ezzuna first deal post. Help out by leaving a posting tip or just to show your appreciation for their contribution.